SARAJEVO – A workshop on electronic government (eGovernment), promoting information society in South East Europe (SEE) as a platform for economic growth, competitiveness, social inclusion and high quality of living, was held at the premises of the Regional Cooperation Council (RCC) Secretariat in Sarajevo today. Participants discussed eGovernment development, public services and policies, and had a chance to examine local eGovernment transformation. They were briefed on best international and EU practices and presented with case studies. Local experts presented the current status within eGovernment frameworks and exchanged views on relevant issues with the workshop trainers. The seminar analysed key governmental projects and brought discussion on project funding mechanisms. The workshop gathered governmental leaders, ministry and authority executive personnel and experts in the field of eGovernment from all over the SEE region. 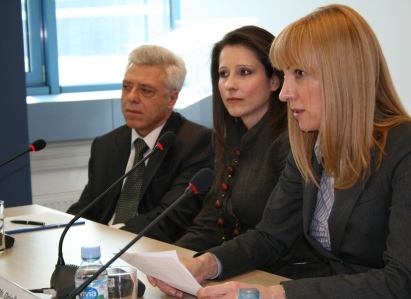 It was held under the auspices of the Southeastern Europe Telecommunication & Informatics Research Institute (INA) Academy, the Development Assistance Programme of the Hellenic Ministry for Foreign Affairs (HELLENIC AID), in cooperation with the Centre for eGovernance Development (CeGD) and the United Nations Development Programme (UNDP). The event is the third one in a series of five seminars of the INA Academy’s “Centre for eGovernance Programme at South East Europe“, launched in June 2008, and targeting Albania, Bosnia and Herzegovina, The Former Yugoslav Republic of Macedonia, Montenegro and Serbia. The programme provides a common regional tool for creation and transfer of knowledge with regard to eGovernance, electronic trade, growth of modern public administration and reform of political institutions.